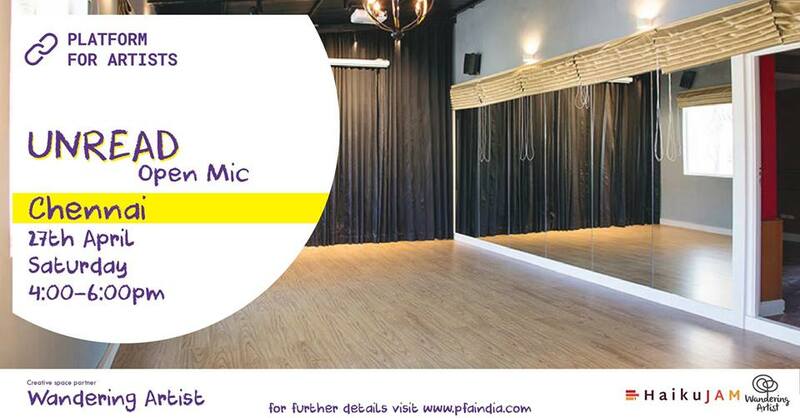 Unread Open Mic - Chennai | Fine Arts, -Storytelling Entertainment at RA Puram. UNREAD is an anthology published by Platform For Artists which is a collection of 99 Hindi/ English poetries and short stories. The book was launched in February and after that, we did a city tour to connect with other artists from across the country. In March, we hosted the UNREAD Open Mic event in 14 cities where more than 100 artists came together to perform, share their stories and connect with like-minded people. UNREAD Open Mic event is a two-hour creatively planned evening where artists writers, poets, painters, sketchers, stand-up comedians, story-tellers, photographers, designers and illustrators, and every other artist can join to perform, showcase their artwork and tell us about their creative journey. We believe in creating a constructive and positive aura where every individual is free to express their ideas. These events are intended to encourage the artist within you by giving a platform which is inclusive, friendly and cheerful. The audience supports and appreciates openly and it helps the artist to grow in their journey. A lot of people come together and start their own ventures after discussing potential ideas in the networking session at the event.